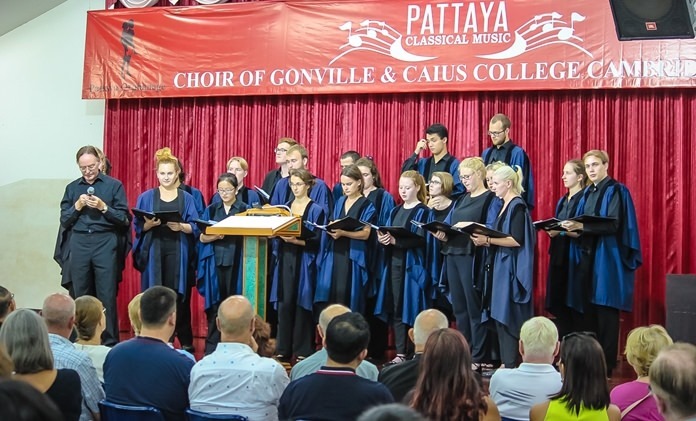 The Choir of Gonville and Caius College, Cambridge performs at Pattaya Orphanage, August 28. A world-renowned British collegiate choir recently brought its diverse repertoire to the Pattaya Orphanage for a benefit stop on its world tour. The 22-member Choir of Gonville and Caius College, Cambridge, led by the Buxtehude scholar Geoffrey Webber, was welcomed by Human Help Network Thailand Director Radchada Chomjinda on August 27. The ensemble, made up of students and volunteers, put on a three-part show of both classic and modern songs. The group, which is also making stops in Bangkok, Singapore, Hong Kong and Mumbai, was sponsored by Gregory Barton of the Pattaya Classical Music Club, Judith and Les Edmonds of the Pattaya City Expats Club and Helle Rantsen of the Pattaya International Lady’s Club. Radchada thanked all the sponsors for their support as well as others who contributed to the Orphanage’s fund at the event. The choir was well received, although its second and third sets, comprised of music from musicals and film, brought most applause. The Choir of Gonville & Caius College is one of the United Kingdom’s leading collegiate choirs, with a worldwide reputation based on its extensive touring and broadcasting, and on its CD recordings. The choir’s regular work consists of singing chapel services three times a week during term, performing sacred music from all periods. Out of term, the choir gives concerts at home and abroad, appearing in concert series in the U.K, such as the Aldeburgh and Spitalfields festivals in London, and performing in concert halls and churches across the world.